The bracket systems we use to affix curtain tracks onto walls are among the best on the market, but our double wall brackets are particularly cool. If you thought hanging just one curtain track is a blast – try two! These brackets allow you to install two tracks in parallel, which gives you a lot of creative freedom when it comes to hanging and arranging curtains. Most people install this system to have a sheer panel and decorative or blackout curtain, but you can let your creative juices flow with other combinations. Our double wall brackets are similar to a double-rod system with one HUGE advantage: the brackets don’t interfere with the movement of the curtains. These brackets hold the track above the carriers, allowing them to slide right under. This is particularly important if you are covering a large area or a whole wall. With rods you would have to create a curtain panel for each section of the rod (and you will have several sections if the area is wide), but with curtain tracks you can cover the whole wall with one large curtain if you want to. If you have a curved wall, such as with a bay window, and you want the curtains to move smoothly from one side to the other, our double wall bracket for flexible track will hold two of our Flexible Curtain Tracks, which can be bent by hand as needed without compromising strength (use flexible curtain track carriers and standard drapery hooks). If you are on the straight and narrow, and need a bracket that can handle some heavy draperies, our double wall bracket will do the trick. 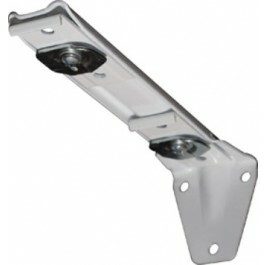 Two of our ball-bearing carrier curtain tracks can be installed into this bracket for parallel strength (use ball-bearing carriers and drapery hooks). Don’t forget - you will need end caps for two tracks! Visit us on Pinterest to get some ideas for using double wall brackets!